Tsavo West is a now separate part of the huge Tsavo area, with over 21,000 square kilometers the size of the US state of Massachusetts. 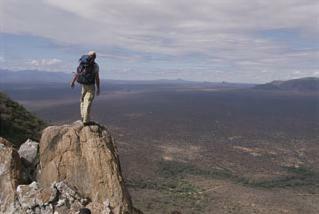 The Western park has some of the most dramatic scenery of all the Kenyan national parks, more so than Tsavo East which consists more of open savannahs. The downside of all this vegetation is that wildlife is often harder to spot in West than East. While the park is popular, it doesn’t draw the massive number of tourists of Masai Mara or Amboseli. The landscape of the park is made up of volcanic hills, sweeping areas of savannah. Tsavo was once the land of the Watta, Orma, Kamba and Masai peoples, but their villages have all been displaced when Tsavo became a national park. Both the Western and Eastern park have been suffering from massive poaching in the 1980s. The elephant population was decimated from 45,000 to 5,000 animals, and the rhino population disappeared almost completely. While KWS has since combated poaching fanatically, and the numbers have risen again, poaching sadly seems to be on the rise again. Tsavo East and West – once one single park, now separated – are divided by the railway and road from Nairobi to Mombasa. You have to pay separately for entering each park. 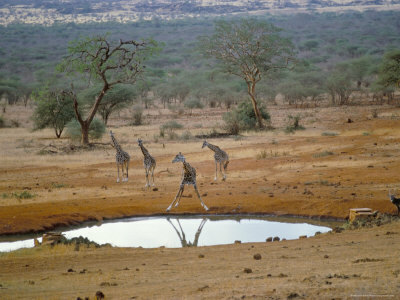 Tsavo West has large populations of elephants, hippos, leopards and zebras. Lions are present too, but they are hard to spot. The information centre at Kilaguni lodge usually has up-to-date information on the whereabouts of lion and cheetah prides. Some 50 black rhinos, as well as large numbers of elephants and buffaloes, can be seen in the Ngulia Rhino Sanctury, which covers a fenced area of 70 square kilometres within the park. Lack of budget is less of a problem in Tsavo West than in the other main parks. There are 3 campsites: one near Kamboyo Hill with toilets and showers, one outside Chyulu Gate with the same facilities, and one at Lake Jipe. There are also two good banda camps, Ngulia and Kitani. You can hire chalets there on either a self-catering or a full board basis. Even more upmarket, the park has some magnificent, if expensive, lodges. Finch Hattons Tented Camps is probably the most luxurious tented camp in Kenya, with crystal candles and chevaliers, and Afghan rugs in the tents. Ngulia Lodge offers a terrific view over the rhino sanctuary. If you don’t have your own vehicle and are looking for a tour outside an organized safari, then Tsavo West is the cheapest of all the big parks to visit. You can take a bus from Nairobi or Mombasa, and get out in Mtito Andei, 500 metres from the main gate where you have a big chance of getting a lift into the park. It’s also possible to fly from Wilson Airport in Nairobi to the park. The park has no less than 7 airstrips: Kilaguni, Kamboyo, Tsavo Gate, Kasigau, Jipe, Ziwani, Maktau, and Finch Hottons. The park totally has 7 entry gates. Entry fees are $40 for adults and $20 for children (non-Kenyans). Payment is by smartcard only.